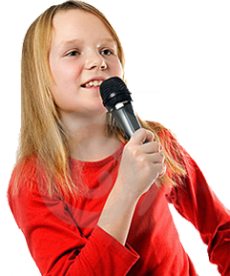 This fun-filled karaoke singing and vocal coaching class will teach your child pitch training, breath control, resonance, intonation, diction, vocal cord preservation, and the development of high and low registers. Your child will learn proper performance etiquette and vocal expressions along with building confidence in the skills of singing. The music for this camp will be from Disney's Greatest Classics Song Collections and current kid-friendly Top Pop Song selections.